Digital ad spending in 2014 is approximated to have hit 137 billion U.S. dollars (source). The majority of these budgets are allocated in a suboptimal manner. Mainly because either marketing channels are optimized in an isolated and channel specific way, because performance attribution is flawed or both. Optimizing digital marketing budget allocations requires a cross-channel perspective. Analyzing touch points and journeys of not only converting users but also non-converting users is key. Understanding the differences in user journeys between user journeys that lead to a conversion and the ones that don’t is important to correctly evaluate the performance of each channel in the marketing mix. In the first post of this mini-series on marketing attribution I’ll first describe the problem, what marketing attribution is and why marketing attribution is such a big issue in digital advertising. In the second post I’ll present a solution for marketing attribution which includes statistical modeling for quantifying the effect of different marketing channels. In the last post I want to discuss a system and tool for marketing decision makers which includes a standardized tracking solution and simple reporting view. Being able to accurately measure these journeys is a technical challenge. Erroneous or inconsistent tracking implementations would lead to incorrect user journey data and hence result in misleading attribution analysis: garbage in, garbage out. Device switches (users journey starts on mobile device, product is bought on desktop) and cookie deletions need to be taken into account as well. I’ll discuss these issues in the following posts. But given that tracking is implemented correctly, the question is, which of the above described attribution model is the correct or most adequate one? Did the Facebook ad click at the beginning of the user journey contribute to this user’s purchase at all? If so, how much? You should be aware of “experts” claiming that they have a precise and general answer to these types of question. The only honest answer would be: “I don’t know”. By now it’s probably obvious, but depending on the attribution model chosen the performance evaluation of the channels will differ dramatically. The following table displays the CPO (Cost per Order) for the four channels in this user journey. For demonstration purposes it is assumed that every customer journey looks exactly like the one above. Following the Last-Click and Time-Decay Model Retargeting seems like the most profitable channel (lowest CPO), whereas from the Linear Model it follows that Retargeting it is the least profitable. 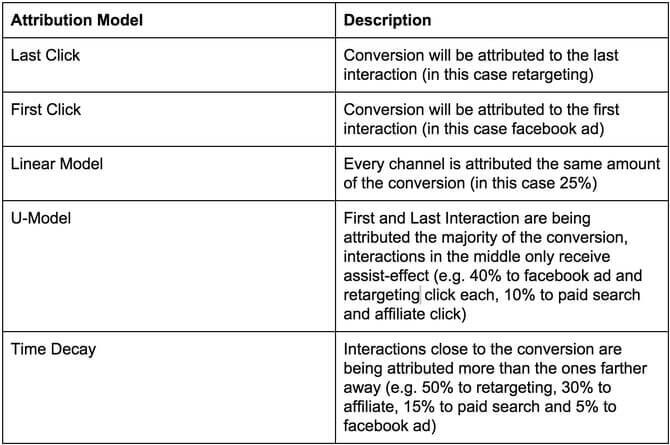 Looking at the First-Click, U- and Linear-Model Facebook Ads look like the most profitable channel. Additionally, following Last-Click (First-Click) one would perceive Facebook Ads (Retargeting), Paid Search and Affiliate as unprofitable. The intriguing thing is, that CPO is one of the key performance indicators for evaluation performance of online marketing campaigns across all marketing departments. Budget allocations are directly derived from CPOs. Choosing any of the above mentioned static attribution models can have fatal consequences and is risky. Another widespread flaw in online marketing controlling is only looking at the journeys of converting users. 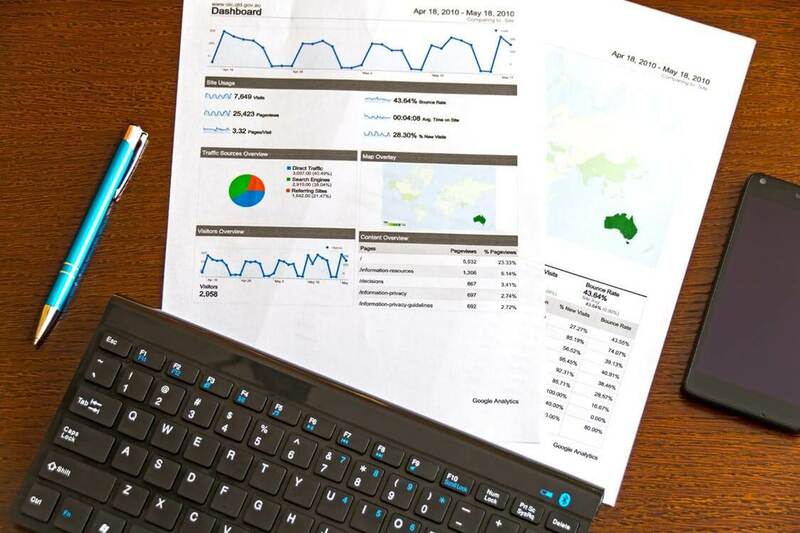 For optimizing digital marketing budget allocations it’s important to understand differences in the journeys and touch points of customers and non-buying users. For example assuming you knew, that 25% of all your buyer’s journeys included a click on a generic keyword campaign in Google Adwords. You might be tempted to announce that this channel is a great indicator for predicting whether a journey will lead to a purchase. But what if 60% of all your non-buyers had this touch point as well, do you still think it’s a good indicator for a user buying? The popular application of last-click attribution leads to greatly overestimating the effects of channels that are more likely to happen at the end of a customer’s journey, for example paid search clicks or retargeting. This was a major factor in the rise of coupon-code affiliate sites. These sites aimed at “pulling in” the last-click before the order to tap some of the revenue through rev-share models. Last-click attribution also facilitated the impressive rise of retargeting. Retargeting by concept and definition could never be the first touch point in a user’s journey and very often is the last click. I worked with clients that shifted the majority of all their online marketing budget towards retargeting, away from “assisting” channels since retargeting looked very profitable from a last-click perspective. This lead to a massive decrease in the performance of retargeting. The potential of users that could be retargeted dried up, due to a lack of “fresh” users coming in through the assisting, non-last-click channels. The retargeting company AdRoll recently conducted a survey with 1000 marketers. One of the results was that the number of marketers dedicating over half of their digital marketing budgets to retargeting is steadily rising. Also more than 90% of those surveyed said that retargeting performed the same or better than search, email or regular display campaigns. These findings and “insights” are most likely due to flawed marketing attribution or no attribution at all. You can’t compare the performance of retargeting against other channels in an isolated manner. Retargeting simply wouldn’t work as a standalone channel without “assisting” channels such as search or regular display ads that provide the visitors which are to be retargeted. Erroneous marketing attribution and performance evaluation seems to be the reason for these questionable findings, since the study also finds that 33% of the surveyed aren’t clear how to do attribution and 76% don’t use multi-touch attribution. According to a survey conducted by Adobe in 2013, 46% of all business don’t do any kind of attribution and 38% perform attribution manually. In a study published by Econsultancy and Teradata marketing attribution technology has the highest priority for senior marketing decision makers. 84% say they plan to invest in marketing attribution system in the near term. These figures show the huge potential for optimizing the allocation of digital marketing budgets through cross-channel user journey analysis and data driven attribution modelling. In the next posts I will show how exactly this can be done.